The Telecommunications Superintendency (SUTEL) on July 1 will host a public hearing to propose a change in the way carriers charge for mobile Internet services. But angry customers are getting ready to fight back. The proposal follows a request by the country’s three carriers, Movistar, Claro and state-owned Kölbi, and it includes charging for transferred data instead of charging for connection speed, which is how plans currently operate. SUTEL already had approved data transfer rates for prepaid plans back in October 2012, but carriers only began charging based on the new rates in mid-2013. Under the new proposal carriers will offer a ₡3,750 ($7) plan for both prepaid and postpaid users that includes 500 MB of data transfer. From that point companies will begin charging ₡0.0075 per Kilobyte (Kb) downloaded. For example, using a smartphone to “Like” a friend on Facebook requires about 13 Kb, which costs about ₡0.10. Uploading a 200 Kb photo to a Facebook wall would cost about ₡1.50; downloading a three-minute mp3 song would cost ₡30, and downloading a 20 Megabyte app would cost ₡180. SUTEL spokesman Eduardo Castellón said the agency would take up to one month after the hearing to respond to any objections, meaning they expect new rates to begin in August. “We believe data transfer rates will provide carriers with more financial resources to improve service quality,” he said. The government apparently agrees with SUTEL. After a Cabinet meeting on Tuesday, Presidency Minister Melvin Jiménez and Science and Technology Minister Gisella Kopper said they are in favor of the proposal because it would improve service for users. 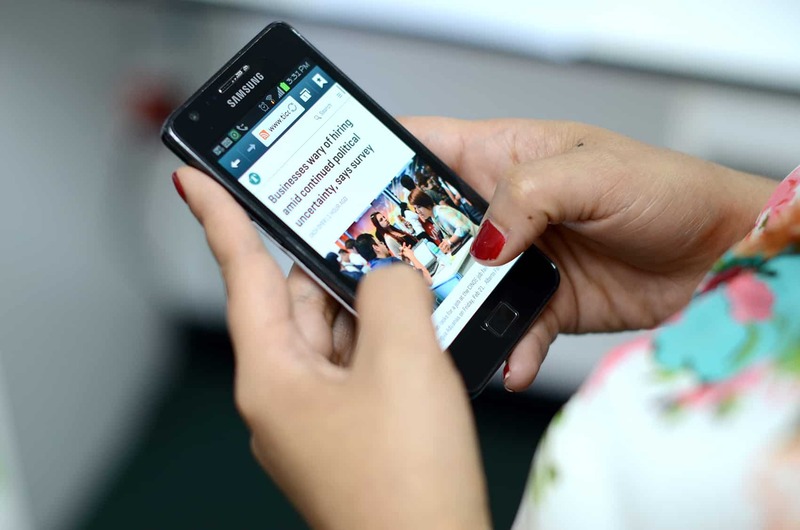 According to SUTEL’s latest report in October, there are 3 million mobile Internet users in Costa Rica. The technology minister also dismissed claims that the proposed change violates free access to the Internet. “Everyone will pay according to their consumption, and the government will make sure no changes are made on current contracts until they are expired,” Kopper said. Matías Señorán, a spokesman with the private carrier Movistar, reiterated that the change would benefit users with better quality service. “A new rate method is necessary, as current unlimited download plans are unsustainable,” he said. Señorán said the company would honor current contracts based on connection speed, ​​and would comply with SUTEL’s ruling. Víctor García, manager of Claro, said the change mirrors common industry practices around the world. He added that his company would adhere to any SUTEL decision on how to proceed with current customers. Many customers seem reluctant to accept the new rate system, expressing their disapproval in chats and on social media networks. Some are organizing a large turnout at the public hearing. Others use Facebook to dispute SUTEL’s arguments, and blame President Luis Guillermo Solís’ administration for supporting the change. Two Facebook pages have popped up to respond, one called “SUTEL: No al cobro por kb descargado,” (SUTEL: Say no to per-Kilobyte downloaded rates), and “No Al Cobro De Internet Celular Por Descarga,” (No to data transfer rates for mobile Internet). Costa Rica’s Ombudsman’s Office recently used social media to ask citizens to share their thoughts on the proposal. “We are interested in your daily experiences using Internet in your lives. We want to know how much you use it and for what purposes, if you have noticed a decrease in speed, and other details that you would like to share. We also would like to receive a copy of your contract to study,” one post from the office said. Customers willing to share their thoughts with the Ombudsman’s Office can do so by sending an email to dhrtarifasmovil@gmail.com. The message should be sent no later than June 20 and must include full name, address and identification number. The Costa Rican Consumers Association also opposes the change, saying it “may be illegal,” according to the group’s vice president, Gilberto Campos Cruz, who said association members would attend the hearing. “First, we believe it is illegal to nullify the current SUTEL rate model and then unilaterally change it. This implies a change in provisions of an existing contract and is a violation of Public Services Regulatory Authority [ARESEP] legislation and the country’s Telecommunications Law,” Campos told The Tico Times. The Consumers Association also challenged the claim that the proposal originated from a carrier’s request and not from technical criteria by SUTEL. “Carriers since 2012 have been asking that the approved change in rates for prepaid plans also be applied to postpaid ones,” he said. SUTEL began studying the issue following the first request by carriers, but that study was suspended when ARESEP’s board of directors ordered the agency to dismiss the request, based on the government’s inability to monitor compliance with data transfer rates, Campos said. “We know many other sectors oppose this. Education Ministry officials, for example, believe the change will affect a large number of students in satellite education programs who use mobile Internet to interact with teachers. I’m sure this is a national concern,” he added. Anyone interested in adding to the debate or opposing the new rate model should attend the public hearing scheduled for July 1 at 5 p.m. at SUTEL facilities in Escazú, southwest of San José. The hearing also will be broadcast via video conferencing in court buildings in Cartago, Ciudad Quesada, Heredia, Liberia, Limón, Pérez Zeledón and Puntarenas.